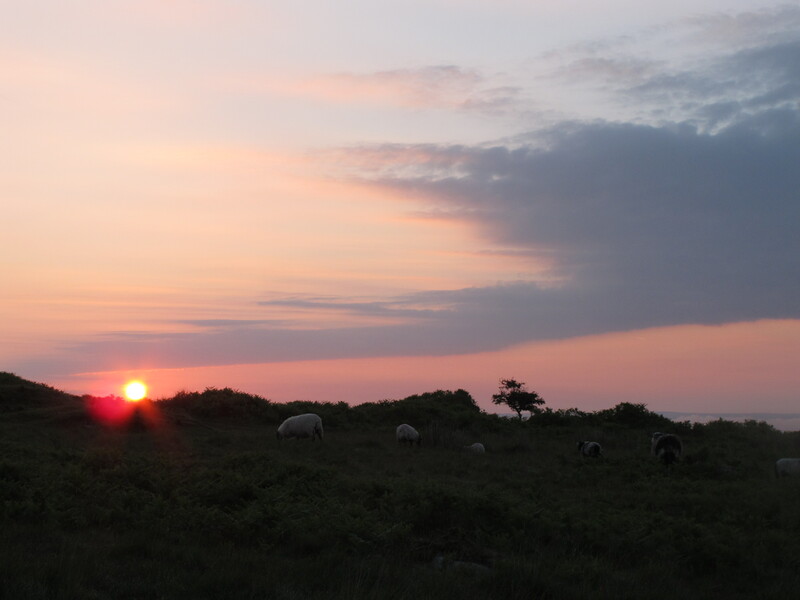 Summer Solstice in Cornwall | Notes from the U.K. This far north, the longest day of the year goes on for 26 hours. Okay, that’s not the literal truth. It’s more like 27. This morning, Wild Thing and I got up at 3:15 (that’s a.m.), staggered out to the car, and drove down the hill to pick up J. so we could drive to a double set of stone circles some 40 minutes from here and join a group of people who gather at the summer and winter solstices to sing up the sun. If that sounds new agey and corny, it probably is. I’m not given to new aginess myself, but when you’re surrounded by ancient monuments the way we are here, you can be forgiven for sliding into a bit of nouveau-pagan celebration once in a while. 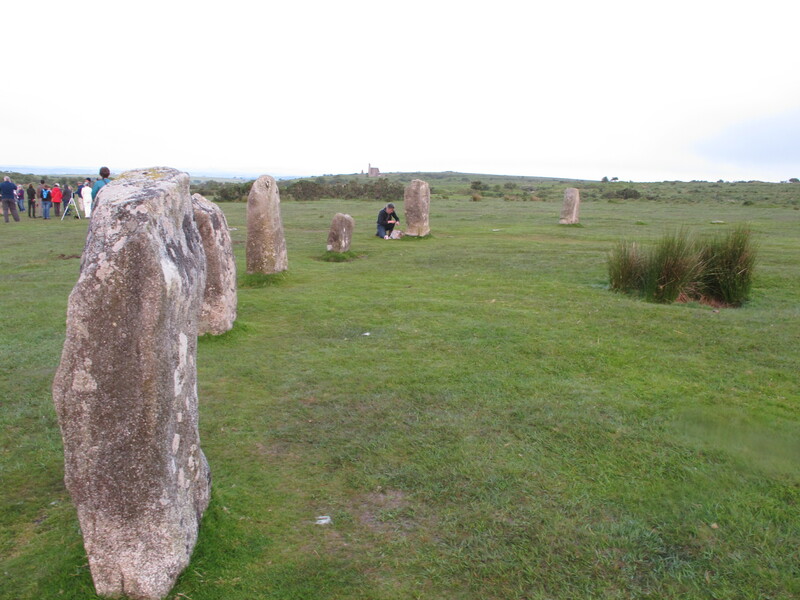 Those who take it seriously do, and those who don’t can still stand inside a stone circle put up by prehistoric people for purposes we can only guess at and be overwhelmed by the scale of human history. It’s the closest I’ve come to touching my ancient ancestors—who (by way of full disclosure) aren’t my ancestors at all, except in the spirit of all humankind being one family. But humankind is one family, and those circles get to me. Not for any magical properties, but for their sheer age. 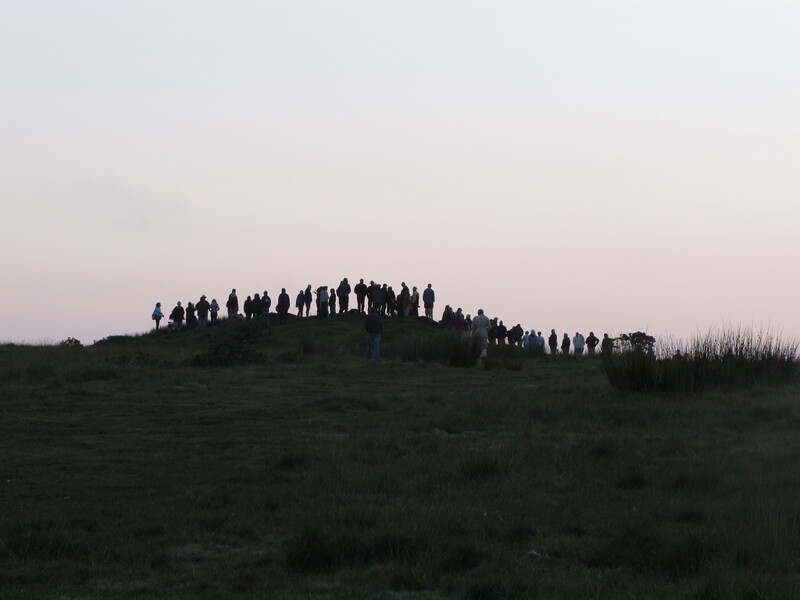 At the stone circles, we joined some hundred other people, dressed in everything from long skirts and ivy-leaf hair thingies, to shorts and blankets, to winter jackets (it gets cold on the moor), and we sang, and the sun came up, as red as it ever was when our ancestors watched it all those thousands of years ago. Then we headed to village pub, which had opened early for us, and we ate breakfast. It wasn’t an exact replica of the way our ancestors and not-ancestors celebrated the solstice, but everything changes with the times. This evening, a group of women from the village will gather on the beach to watch the sun go down. J.’s organized the gathering for several years running, but this will be the first time we’ve gone. All I know is that it involves a bonfire and food. Our ancestors would have understood. This is the first year that J. started the day by getting up at silly o’clock to watch the sun come up, and I told J. I half expect the evening to end with her falling asleep on the beach and everyone gently carrying her home. She said everyone would be more likely to dump her in the sea. This entry was posted in Other Stuff and tagged Americans in Britain, Americans in England, Britain, Cornwall, Dartmoor, England, Minions, New Age, solstice, summer solstice by Ellen Hawley. Bookmark the permalink.